504 Main by Holly Lefevre: Let's Celebrate! 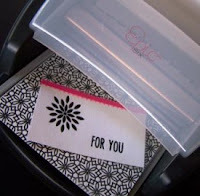 Monogrammed Glasses and a Letterpress Wish Banner...The EPIC Giveaway Continues! Let's Celebrate! 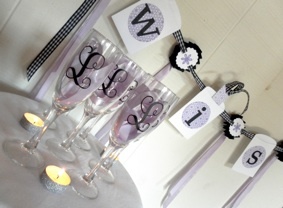 Monogrammed Glasses and a Letterpress Wish Banner...The EPIC Giveaway Continues! Birthday season is in full force at my house. even of my own birthday...whatever...at least I will get what I want. Look at these champagne glasses (hubby if you are reading - you say you don't but I do not believe you) I want some REAL champagne (no sparkling wine, thank you!) 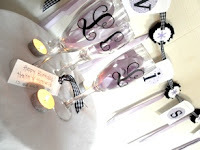 - it is a big birthday...I am entitled to it...and can you please serve it in these glasses I whipped up using Ten23 Designs Personalized Monogram Initial Decals! Go visit The DIY Club for the full tutorial on the glasses. I wanted to think of something special that could be used to really chronicle this time and help us remember to look forward and enjoy life, and maybe remember a thing or two about the past. Of course, this same idea can easily be used for Graduations, Bridal and Baby Showers, and just about any other special life event. I am having way too much fun with my Epic Six Letterpress from Lifestyle Crafts and I may have spent a little cash on their site ordering some new colors of ink and specialty media and printing plates...yes we are BFF's now! There is still time for you to WIN ONE of these super cool machines! Of course the Epic Six Letterpress combo Kit! 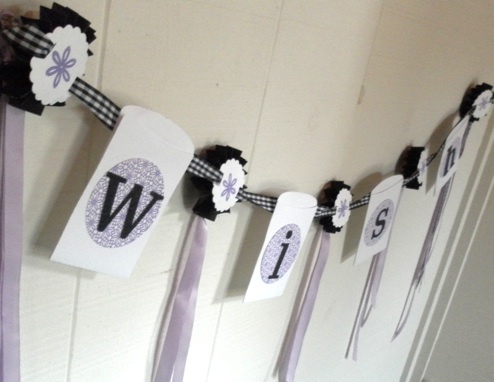 I also used: hot glue, a glue stick, black/white gingham ribbon, lavender ribbon, chipboard letters, as well as white cardstock and black cardstock. 1. So I loved these treat bag die cuts and thought they also make a perfect envelope, so I cut them out of simple white paper and assembled them with a touch of glue. 2. I ran 5 sheets of letterpress paper through my machine (one at a time) using the full printing plate from Everyday. I printed these in lavender - Currently I have two ink colors: black and lavender, so I am going with that color scheme (and I love it anyway). Let the ink dry completely. 3. I cut 10 Party Flag shapes (the large circle with scalloped edges) with the machine using the die cut. 4. I used a flower from the Everyday collection to then letterpress one flower in the center of each party flag inserts. 5. After the ink dried on the full sheets of letterpress design, I ran them through the machine, using the nesting circles die cut (second largest circle). Then I glued the chipboard letters to the circles (centered).These circles then were placed in each treat bag to spell the word "wish." 6. I laid out the banner the way I wanted - one scalloped edge circle on each side and between the treat bags - and ran a gingham ribbon through the slits in the scalloped circles and glues the ribbon to the back of the treat bags. 7. Once happy with the position of the bags and scalloped circles, I attached rosettes (made with black card stock) to the back of the scalloped circles using hot glue. I used hot glue to assemble my banner. Please excuse this photo...I need a new camera! So, what's the point of my wish banner? special note to the guest of honor and deposit it in the bag on the banner. 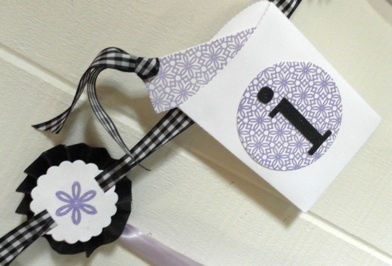 There are many variations you can use with this banner - the host can add special notes and the guest of honor pulls them out to read (think bridal shower). Parents make them for their kids as keepsakes. Friends use it for graduation...I know you all have ideas! It is OK to be materialistic here! it does letterpress, die cuts, and embosses! Holly, I love the glasses and banner, but am bummed that things haven't panned out the way you'd hoped for your birthday. Geri and I would have planned something for you (although the partywear would have been nowhere near as fab), but...your hubby told me weeks ago that he was planning something and to hold the night on my calendar. Hopefully we can resurrect the evening and still rock it! You deserve a day as special as you always make it for other people! HAPPY BIRTHDAY HOLLY! It's a big one..... hmmmmmmm... so a very happy milestone birthday!!!!!! I love your banner! I would love to make one as sassy and fun for a guest bedroom that says "welcome". Love the colors! Great crafty ideas! You can really work with this letterpress thingy. Have anice day. I love those champagne flutes too Holly! Planning your own birthday sort of takes all the fun out of it though. Also, I am totally with you on the real champagne thing too! :D Yes please!! Oh my goodness it's all so totally fab! Happy Birthday to you sweetie. You deserve to be spoiled ROTTEN and you can totally show your hubs this :) I can see how much fun you're having with the Epic Letterpress. AWESOME! Happy happy birthday my friend! Your glasses look fabulous. I hope you celebrate in style. Pop that bottle! What I wish for.. a job that gives me more family time, with a company that doesn't micro manage every minute of their employees' day. Or maybe not to be too chicken to start my own business. Oh and I wish for you to have a fabulous birthday. Guest Post! Redberry Barn is Here! Dreaming of New Dining Room Chairs!